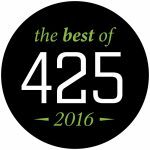 Helsell Fetterman partner and chair of its wealth transfer group, Laura Hoexter, was selected as Best Attorney by the readers of 425 Magazine. The 2016 poll marks the eighth year in a row that Laura has topped the list. Laura’s practice focuses on wills, trusts and business succession planning. Helsell Fetterman is proud of Laura’s continued recognition by the community and her clients. The strongest mark of quality in the legal profession is the satisfaction of those we serve.